Karle Denke was born on August 12, 1870 in Ziebice, Poland and died on at age 54 on December 22, 1924 by suicide. 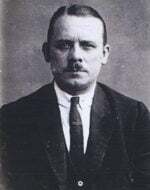 He was a serial killer and cannibal who was known as "The Cannibal of Ziebice" and "Vater Denke"
Karle was born into a wealthy family on August 12, 1870 in Munsterberg, Silesia. Munsterberg, Silesia was known as the Kingdom of Prussia and was renamed Ziebice, Poland which is used now. He was a very hard child to take care. He gave his parents a hard and at the age of 12 years olf, he ran away from home. Karle started a life of his own at age 25 after graduating elementary school and started training under a gardener. Karle bought a piece of land with the money he inherited from his father death. He sold his farm land because he didn"t succeed at farming and bought a small house on a street now called Stawowa Street. Karle was forced to sell his home because he no more money left, but he had refused to moved out, so he lived in a small apartment on the right side of the house on the ground floor. He became an organ player in church and was well loved by his community. In 1909, Karle began cannibalism for no known reasons and killed 25 year old Emma Sander. He began killing dozens of people, and it is believed that he sold the flesh of his victims as pork and offered it to his guest to get rid of the bodies. His last attacked was on December 21, 1924. He attacked Vincenz Oliver with an axe, but Vincenz escaped and found Gabriel who is a coachmen, Gabriel called police. Police found a lot of different types of bones, different clothing, twelve travelers identification documents, a pair of drum with large pieces of meat in brine and pots full of fat. Police believe that Karle killed about thirty people from looking at the remains at his apartment. Karle committed suicide in his prison cell the day after he was arrested. December 21, 1924: Vincenz Olivier - attempted but survived, non-fatally slashed his scalp. Karl Denke serial killer is a male serial killer. The Cannibal Of Ziebice, Vatter Denke is a male serial killer.